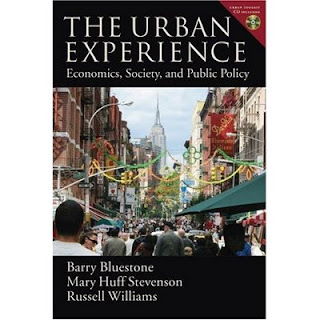 Reading up on American cities, I just come across a very interesting book entitled "The Urban Experience: Economics, Society, and Public Policy" by Barry Bluestone, Mary Huff Stevenson and Russell Williams. The books description: The Urban Experience provides a study of metropolitan areas by combining economic principles, social insight, and political realities with an appreciation of public policy to understand how U.S. cities and suburbs function in the 21st century (click here to read more). 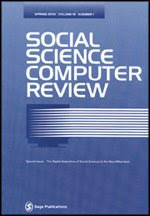 Andrew Hudson-Smith, Michael Batty, Richard Milton and myself from CASA have just found out that our paper "Mapping for the Masses Accessing Web 2.0 Through Crowdsourcing" in Social Science Computer Review which comes out later this year can be downloaded from OnlineFirst. "The authors describe how we are harnessing the power of web 2.0 technologies to create new approaches to collecting, mapping, and sharing geocoded data. The authors begin with GMapCreator that lets users fashion new maps using Google Maps as a base. The authors then describe MapTube that enables users to archive maps and demonstrate how it can be used in a variety of contexts to share map information, to put existing maps into a form that can be shared, and to create new maps from the bottom-up using a combination of crowdcasting, crowdsourcing, and traditional broadcasting. The authors conclude by arguing that such tools are helping to define a neogeography that is essentially ‘‘mapping for the masses,’’ while noting that there are many issues of quality, accuracy, copyright, and trust that will influence the impact of these tools on map-based communication." Keywords: network economies; web-based services; map mashups; crowdsourcing; crowdcasting; online GIS. Oxford Circus in London is a busy intersection between Regent Street and Oxford Street with more than 200m visitors a year (BBC). Work is to begin on a £5m project to pedestrianise part of Oxford Circus. Based on crossings in Tokyo, the new design will stop all traffic in all directions, and allow people to cross diagonally as well as straight ahead. 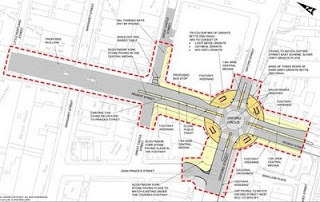 Street clutter and barriers at the junction of Oxford Street and Regent Street will also be removed. Why blog about this? The movie below created by Designhive shows how Atkins' two-dimensional traffic and pedestrian models can be coupled with 3D Studio Max in such a way it is difficult to distinguish the model from a real piece of video footage. Combining the models in the simulation in this way makes the finished product particularly compelling. Furthermore it has the benefit of being based on the technical models developed to test the proposals prior to their implementation (such as the removal of street clutter). The pedestrian model is a particle-based system controlling 5000 agents to match up the data produced by Atkins Intelligent Space. 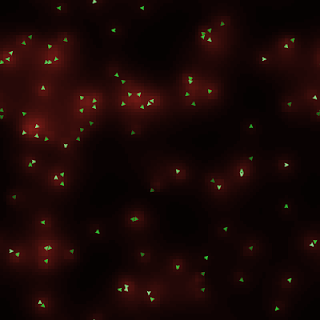 When the final simulation was rendered, the 'particles' were replaced with animated people, programmed to walk while the points were moving and idle when the points stopped for traffic lights. Going through my RSS feeds I came across three articles which are quite interesting and I thought worth sharing. 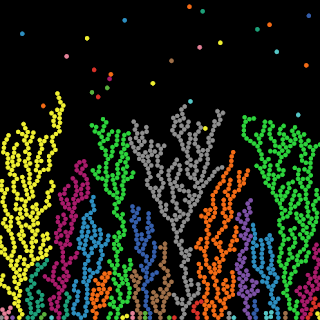 The images to the above and below are examples from the article about are clear and aesthetic visualizations from the NetLogo model library. 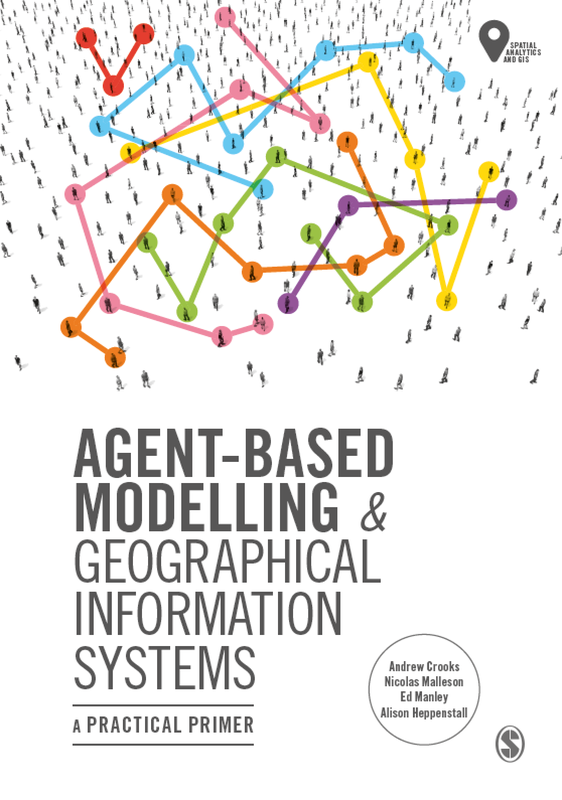 The second article entitled 'Tools of the Trade: A Survey of Various Agent Based Modeling Platforms' by Nikolai and Madey (2009), which offers advice for choosing the appropriate agent-based platform for a specific modelling endeavour. 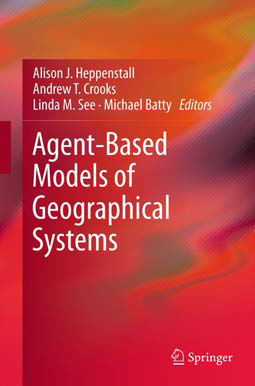 The paper references and extends our own work at CASA "Principles and Concepts of Agent-Based Modelling for Developing Geospatial Simulations." Specifically the paper reviews a number of toolkits and characterize each based on 5 characteristics users might consider when choosing a toolkit (e.g. programming language , type of license, operating system, domain, user support), and then we categorize the characteristics into user-friendly taxonomies that aid in rapid indexing and easy reference. The authors have also developed a web-based tool that incorporates all their findings, users input a range of characteristics, and the tool returns a list of candidate platforms that contain those characteristics (such as operating system). The tool is available at http://agent.cse.nd.edu/abmsearchengine.php. Furthermore, Nikolai and Madey (2009), have created a wiki page entitled "ABM Software Comparison," and it is linked from the main "Agent Based Model" post on Wikipedia which anyone can alter or expand. The third paper by Heikkila and Wang, which is in press in Environment and Planning B, entitled "Fujita and Ogawa revisited: an agent-based modeling approach" which builds on and extends the work of Masahisa Fujita and Hideaki Ogawa in 1982. The authors employ an ABM approach that seeks to replicate the individual household and firm behaviours that lead to equilibrium or nonequilibrium outcomes but more specifically addresses questions of path dependency and bounded rationality that lie well beyond the scope of the original work of Fujita and Ogawa (1982). On a side note there appears to be two interesting courses for agent-based modelling this summer. The first is the Lipari International School on Computational Social Sciences, July 18 - 25. The second is Capturing Business Complexity with Agent-Based Modeling and Simulation, May 18- 22, 2009. Fujita, M. and Ogawa, H. (1982), 'Multiple Equilibria and Structural Transition of Non-monocentric Urban Configurations', Regional Science and Urban Economics, 12(2): 161-196. Heikkila, E.G. and Wang, Y. (In Press), 'Fujita and Ogawa Revisited: An Agent-Based Modeling Approach', Environment and Planning B: Planning and Design. Kornhauser, D., Wilensky, U. and Rand, D. (2009), 'Design Guidelines for Agent Based Model Visualization', Journal of Artificial Societies and Social Simulation, 12(2), Available at http://jasss.soc.surrey.ac.uk/12/2/1.html. Nikolai, C. and Madey, G. (2009), 'Tools of the Trade: A Survey of Various Agent Based Modeling Platforms', Journal of Artificial Societies and Social Simulation, 12(2), Available at http://jasss.soc.surrey.ac.uk/12/2/2.html. Researchers at UCL have created a Facebook application called mynameprofiler which works alongside your Facebook profile to tell you what your name, the names of your friends and family, and the names of your neighbours say about you. For example, in my neighbourhood, people have higher status surnames than 66% of the population (one has to remember that this is for fun). If you have a Facebook account, the application can be downloaded from http://apps.facebook.com/mynameprofiler/ however, it only works for the UK at the moment and some data is stored. Below is Alex Singleton's presentation entitled "Geographic data mining of online social networks" which explains a bit about the project and was presented at GISRUK 2009. Further information about the application can be found on the PublicProfiler site. On a side note the Economist has an interesting article on about the size of friend networks in Facebook and parallels with evolutionary sociology. View more presentations from Alex Singleton. "In this paper we analyse the street network of London both in its primary and dual representation. To understand its properties, we consider three idealised models based on a grid, a static random planar graph and a growing random planar graph. Comparing the models and the street network, we ﬁnd that the streets of London form a self-organising system whose growth is characterised by a strict interaction between the metrical and informational space. 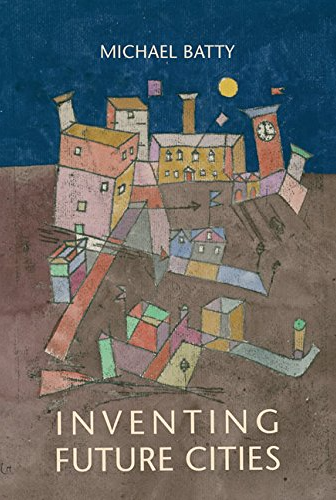 In particular, a principle of least effort appears to create a balance between the physical and the mental effort required to navigate the city." Brian Castellani of the Sociology and Complexity Science blog and the art & science factory website has created a nice diagram entitled "the map of complexity science." The map is a conceptual and historical overview of complexity science from the 1940s to the current day. Not only does the map highlight important players in the field (such as Stuart Kauffman) but also demonstrates how agent-based modeling, cellular automata, and genetic algorithms are linked together and more generally with complexity science. The map is well worth exploring as it has many hyperlinks to other sites.